MacLaine sued Hal Wallis[when?] over a contractual dispute, a suit that has been credited with ending the old-style studio star system of actor management. ^ "Shirley MacLaine - Live at the Palace at Discogs". discogs.com. Retrieved 11 April 2017. 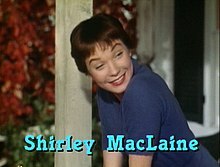 ^ "Shirley MacLaine Live at the Palace Gets CD Release April 23". Playbill. Retrieved 11 April 2017. ^ McNary, Dave. "Shirley MacLaine Starring in 'A Little Mermaid' Movie". Variety.com. Variety.com. Retrieved 23 February 2016. ^ "Parker v. Twentieth Century-Fox Film Corp., 474 P. 2d 689 - Cal: Supreme Court 1970". Google Scholar. Retrieved 24 January 2018. ^ "Parker v. Twentieth Century-Fox Film Corp. (Cal.)". Prentice-Hall, Inc. Retrieved 24 January 2018. ^ "Parker v. Twentieth Century-Fox Film Corporation (California 1970)". CaseBriefSummary.com. Retrieved 24 January 2018. ^ Creighton, Sam (13 February 2015) [12 February 2015]. 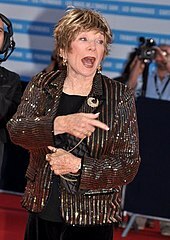 "Outrage as Shirley MacLaine Asks Were Holocaust Victims Paying for Sins in Past Lives?". Daily Mail. London. Retrieved August 21, 2017. 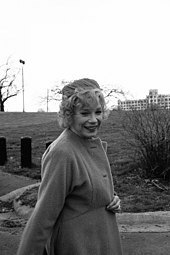 Wikimedia Commons has media related to Shirley MacLaine.